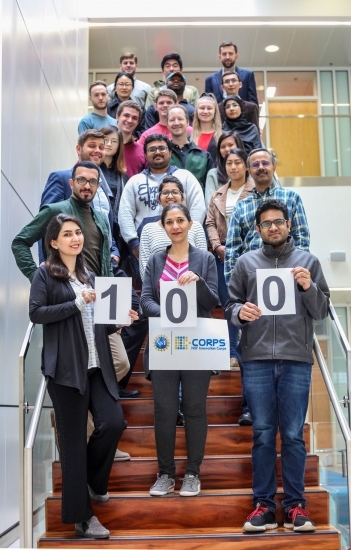 The Ventureprise Launch NSF I-Corps customer-discovery program wrapped up on Friday, April 5th, celebrating its 100th UNC Charlotte team to complete the program. NSF I-Corps focuses on assisting students and professors with exploring the commercial possibilities of their research. Since the inaugural 2015 cohort, over 3500 interviews have been conducted exploring commercial viability of research ranging from developing a free standing flood prevention wall to extending the operational lifetime of flexible electronic devices through customized materials. Each team is composed of an entrepreneurial lead (student) and academic lead (faculty member). Throughout the program teams are required to conduct 30+ interviews in six weeks to help them identify a viable market for their research/innovation. Eight of these teams were selected to participate in the National I-Corps Program, receiving $50,000 to continue their customer discovery by traveling across the country to interview at least 100 additional customers. “This program provides UNC Charlotte students with the opportunity to learn about business and societal problems their research can solve.” says Devin Collins, interim executive director of Ventureprise. The NSF I-Corps program prepares participants to extend their focus beyond the university laboratory and accelerate the economic and societal benefits of NSF-funded, basic-research projects that are ready to move toward commercialization. “Through our customer interviews, we identified a potential partner and will be meeting with them to discuss a collaboration,” stated Roshanak Ashrafi during her final presentation. Ashrafi is a Ph.D. student in the College of Arts and Architecture and working on an inter-connected hybrid lab focusing on personalized comfort technologies. The program welcomes new participants from the university every spring, summer and fall. Go to www.entrepreneurship.uncc.edu or visit Ventureprise in the PORTAL building at UNC Charlotte to learn more about their programs.